Ice jams are a concern as temperatures rise. WEST SENECA, N.Y. — West Seneca officials are concerned rising temperatures could create dangerous floods. "We've seen this creek come up on a dime, so the opportunity for us to do whatever we can in preventative measures like we have in those prone neighborhoods," Sheila Meegan, West Seneca Supervisor, said. Rising temperatures loosens ice which begins to flow down the Buffalo creek. 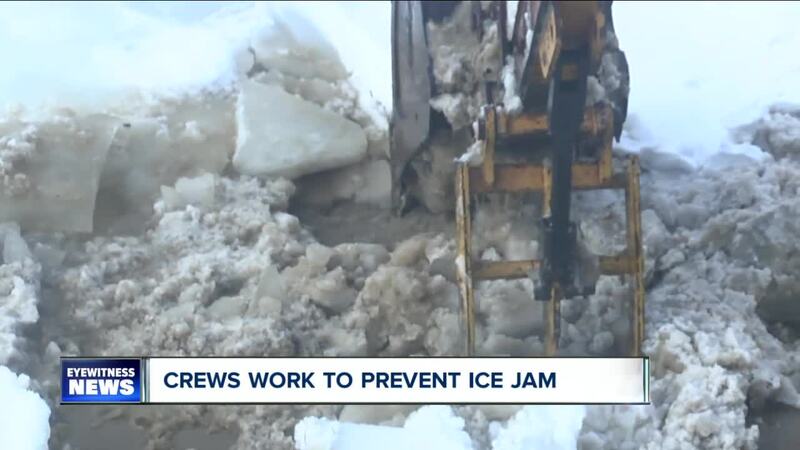 That can cause a jam if the ice can't continue to move down the creek, which raises water levels. That's why crews were out early Sunday morning breaking up ice with a 60-foot excavator. "If we can break it up with this equipment, and start the ice flowing down the stream, we can overt potential damage to property, Lieutenant Governor, Kathy Hochul, said. Crews addressed three different bridges in West Seneca: South Ogden, Harlem, and Clinton. "We have to do it. It's not even an option," state assemblymember Pat Burke, said. In 2014, ice jams caused major flooding in the Lexington Green neighborhood of West Seneca that cause hundreds of thousands of dollars worth of damage. "we've seen what happened. We saw it in 2014," Meegan said. In the event of flooding emergency crews are standing by to assist anyone that needs it. There are also pumps placed around West Seneca that will divert water so the sweage pipes don't over flow and spill water into the street.